Moakley Park in Boston, Massachusetts, is the largest city park located along Boston Harbor. Constructed in the early 1900s and named after South Boston native-turned U.S. Rep. Joe Moakley, it is accessible to a wide range of the city’s population. It’s within 15 minutes of a diverse set of Boston’s most socially vulnerable neighborhoods and is served by two Red Line T stops and highway access for visitors from across Boston and the region. Roadway connection via Columbia Road, once envisioned to be the final link in Frederick Law Olmsted’s Emerald Necklace, connects Moakley Park to an incredible network of parks that serve many of Boston’s neighborhoods. Combined with Carson Beach and the South Boston/Harbor Point waterfront, Moakley Park could be part of Boston’s longest, most diverse and most spectacular stretch of waterfront parks. In 2018, the Boston Parks and Recreation Department launched the Moakley Park Vision Plan to transform and take advantage of this site’s significant social and environmental potential as part of a larger harborwide vision for climate resiliency tied to social equity. The Moakley Park Vision Plan builds on Boston’s harborwide planning for coastal resilience, set forth by Mayor Walsh. With 36 inches of sea-level rise, Moakley Park, combined with Fort Point Channel, becomes the flood pathway for portions of the city’s South End and Roxbury neighborhoods during a 1 percent storm event, like a 100-year flood. By elevating areas of the park and integrating those areas into a flood-protection berm, Moakley Park can become an important component of a citywide strategy to protect neighborhoods and critical assets from future risk. In fact, the park is particularly important to the city’s resiliency strategy because of the highly vulnerable populations impacted by this flood pathway. Directly adjacent to Moakley Park are two low-income housing projects, one of which is the oldest existing in Boston. The residents of these areas are subject to significant financial strain, which would be exacerbated by future flood risks. Protecting these neighborhoods is a priority for the region and the city. The re-envisioned Moakley Park takes on impending climate change threats, upgrades existing facilities and adds new programs and activities to attract new users. In addition, it creates a more ecologically diverse and sustainable landscape and explicitly addresses issues of equity and access to the harbor for all. How the city empowers residents to become active participants in the co-creation and continued stewardship of Moakley Park is an important element of the vision plan’s future success. The city and the design team, led by Stoss Landscape Urbanism, held a multifaceted community-engagement process throughout the duration of the project. Stoss and its partners, ONE Architecture and Urbanism and Nitsch Engineering, worked with the parks department to generate a community engagement strategy that would gather community input on the future of the park, help develop a vision plan that addresses major community concerns and interests, and garner support for the final vision plan. The strategy was broad based and geared toward getting input from a variety of Boston residents. Presentations, visual communication and physical models were utilized across multiple engagement strategies to communicate ideas to a diverse audience. The team also collaborated with city agencies and officials to begin generating implementation strategies. The foundation of this engagement was a series of open houses and on-site events. DISCOVER Moakley! was a daylong event dedicated to bringing fun and energy to Moakley Park. Boston Parks and Recreation Department, Greenovate Boston, Save the Harbor/Save the Bay, Boston Harbor Now, The Trust for Public Land and the Department of Conservation and Recreation teamed up to demonstrate how simple activation of the park can connect people to the space for a diverse range of activities. The event spanned beyond Moakley’s perimeter and involved closing a portion of William Day Boulevard and portions of Carson Beach to further introduce the idea of connecting the community, the park and the beach. In addition to enjoying a beach-themed inflatable installation, live music, acrobatics on the beach, exercise classes in the park, local food and beer, skateboarding and parkour, visitors were also asked for input on the Moakley Park Vision Plan and to participate in activities that exhibited green infrastructure and coastal resilience strategies. One-on-one interviews were held with participants who wanted to talk in greater depth about their experiences, memories and aspirations for the park. DISCOVER Moakley! showed participants how the park could evolve into a multifunctional urban waterfront park that combines athletics with resiliency efforts and new programs to better suit and connect its diverse community. In addition, an interdepartmental group, composed of city agencies, worked with the design team to consider broader implications and co-ordinate efforts relative to other city initiatives. A Community Advisory Group, composed of community leaders and residents, represented the community’s interest in small-group conversations and guided the design team on program organization. This group provided an opportunity for the city to hear from community members who have lived in the South Boston neighborhood for generations, but also incorporate new voices with varied interests that will use the park in the future. The site is well-situated from a regional transportation context but is disconnected from and unsafe to access by its local neighbors. The park’s proximity to the waterfront is not easily understood. A lack of topography in the park, except for the stadium area and bridge crossing over Old Colony Avenue to the west, prevents visual connection to the beach. Climate projections threaten the park on several levels. Projected sea-level rise will perpetuate flood risks through future coastal flooding. Increases in precipitation are likely to exacerbate the existing issues of flooding fields. The surrounding context is undergoing significant development. Currently approved and planned developments will nearly double the surrounding population. Embedded in these areas are numerous additional opportunities for active play, including an adventure playground, sledding hill, BBQ area, flexible fields, water play, field houses with community space and a waterfront cafe offering a premier location for events or just relaxing with refreshments after a game. The design and programming of these recreational spaces are organized through the development of a park-wide coastal flooding protection system, a berm running the length of the park and connecting to high points in the surrounding context at either end. The berm is strategically placed close to the front of the park but not immediately at its waterfront boundary. The goal of connectivity and continued access to the waterfront leads the team to a strategy of pushing and pulling the berm back and forth from the waterfront edge. Doing so creates a dynamic experience that brings the community close to the water, provides views of the harbor and creates large, slightly raised yet protected areas in which fields could be placed. The result is greater community access and the creation of a variety of field conditions, providing diversity in playing experience throughout the year and in different climate conditions. Moakley Park is already subject to flooding from rainfall. With even small rain events, the playing fields are flooded and unusable. Stormwater management is, therefore, both a critical component of improving playing fields at Moakley Park, as well as an important component of developing a resilient Boston Harbor. Currently, most stormwater that collects in the park is generated by land surfaces in or directly adjacent to Moakley Park. The vision plan provides ample opportunities to manage stormwater in large underground chambers beneath the soccer and multiuse fields, as well as the baseball and football fields. Using highly efficient chamber systems in these areas could provide almost 5 million cubic feet of subsurface storage for stormwater management. Additional ecological systems-based strategies include stormwater wetland systems, porous pavement in parking areas and swale systems along adjacent streets that will provide an additional 700,000 cubic feet of storage. Preliminary calculations indicate that these storage volumes could collect, infiltrate and detain storm events up to the projected “16-inch” or 500-year rainfall event in 2100, as described by the Boston Water and Sewer Commission’s “Wastewater and Storm Drainage Facilities Plan,” published in 2015. Together, these methods will keep fields dry, keep stormwater from flowing directly to the harbor and provide the means for creation of new ecological systems within the park. In addition, areas of stormwater collection integrated into play and recreation areas provide an opportunity for the community to learn about stormwater management. Moakley Park currently exhibits low landscape diversity through its vast expanses of grass and minimal trees. This limited diversity of vegetation does little to contribute to the area’s ecological value. Increased quantity and variety of vegetation proposed in the vision plan will help to achieve a level of ecological diversity that would make for a healthier environment for people, plants and wildlife. This increased vegetation also serves the larger goals of citywide climate resilience, as increased shade in the park will help to combat the increasing temperatures and number of predicted hot days. Importantly, this shade and respite from the heat will be provided directly adjacent to many of the city’s most underserved populations and to areas with low-vegetative cover and subsequently high-heat index. Boston Harbor is one of the city’s greatest assets. A generation ago, it was a degraded, toxic landscape. Spectacle Island was a landfill, the industrial waterfront was suffering from decades of decline and disrepair, and it was understood that contact with the water was dangerous to your health. Decades of work and billions of dollars in public and private investment have made the harbor and The Harbor Islands safe and enjoyable. Today, the islands are the largest recreational open space in Eastern Massachusetts. Just minutes from downtown Boston, the harbor islands provide Bostonians and visitors with incredible views, history and recreational opportunities. Moakley Park is a gateway to Boston Harbor and The Harbor Islands; however, in its current condition park goers are hard pressed to feel any connection. Lack of topography in the park results in little to no visual connection to the water and multiple lanes of traffic make physical access to the water less desirable and dangerous. The Moakley Vision Plan seeks to minimize these challenges and increase the linkages between the communities adjacent to the park, the harbor and the islands beyond. This goal is achieved largely through topography and the creation of the coastal protection berm. Careful coordination of access points leading up to the top of the berm help make it a point of connection and not separation. The central-most point of access to the park connects directly to the adjacent residential housing and brings visitors along a sloping ramp, at the top of which they enjoy an expansive view of the harbor while sitting at a cafe or standing on the overlook. Below, a waterfront plaza provides free programming and water play. 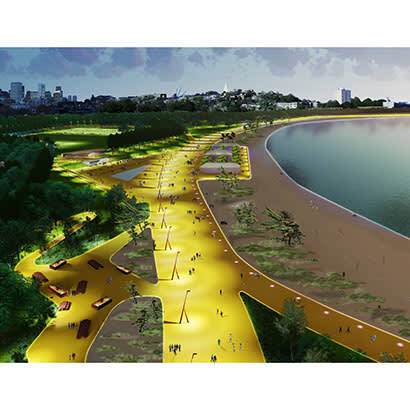 And, over time, William Day Boulevard will be transformed into a pedestrian promenade activated by people, beach-side basketball courts and street festivals, once again reconnecting the community with the Boston waterfront. The berm and raised landscapes do more than simply protect the community, they provide significant social and recreational opportunity and provide physical and visual access to the waterfront. Access that is of great importance for populations with limited resources and space and for whom the park and waterfront serve as their backyard. The Moakley Vision Plan is an exciting new stage in Boston’s relationship to the harbor, one that includes celebrating Boston Harbor’s cleanliness through community access and protection from the future dangers proximity to the harbor presents. It’s also an exciting new space where the South Boston community can gather, play and celebrate life. As team members wrap up the vision plan this month, they will be sharing it with the community and elected officials, getting overall feedback and impressions that will help them shape the next steps of the design process. With this feedback, Boston Parks and Recreation Department plans to embark on further detailed design studies and generate a phasing plan that will allow for implementation to begin, while retaining active recreational uses during construction. Exciting things are coming to Moakley Park! Amy Whitesides is a Studio Director for Stoss Landscape Urbanism, Elaine Stokes is a Project Designer for Stoss Landscape Urbanism and Alex Marchinski is a Senior Landscape Designer for Stoss Landscape Urbanism (@stosslu).